Kunal Merchant occupies a fascinating perch in the Green-Sports world. A member of the Green Sports Alliance board, the Bay Area-based Merchant has a background in business, politics, and social enterprise. And as co-founder of Lotus Advisory with his sister Monisha, Merchant has guided the sustainability efforts on state-of-the-art green stadium and arena projects, from Sacramento’s Golden1 Center — the first LEED Platinum indoor arena in the world — to the nascent Oakland A’s ballpark project. Kunal Merchant: It has been a fascinating ride to this point, Lew. I came to the sports world from the political side, working as Chief of Staff for then Sacramento Mayor and ex-NBA All Star Kevin Johnson. I served in that role during his first term, between December 2008 and June 2012, which was a dramatic time. The Mayor took office right as the national economy was entering the Great Recession. Sacramento was particularly hard hit by double-digit unemployment and a foreclosure crisis. Morale was low, and right when the town thought it couldn’t get any worse, we found out that our beloved Sacramento Kings – the one and only pro sports team in town – wanted to leave town. The team had been struggling both on and off the court for years, including several failed attempts to build a new arena to replace what had by then become the oldest and smallest arena in the NBA. The Kings’ ownership felt that their best shot was to start over in a new city, with Seattle being the most likely destination. It was a punch to the gut for Sacramento, and in the Mayor’s office, we knew that how Sacramento responded to this challenge would have implications far beyond sports for the city’s economic and civic identity. Kunal: That’s a topic for a much longer conversation! But, oversimplified, there were three key checkboxes on our “to-do list” to save the team: (1) prove that Sacramento was a viable NBA market; (2) recruit a new ownership group willing to buy the team and keep it in Sacramento; and (3) develop a plan to build and finance a new arena. The arena was arguably the most critical – and difficult item – particularly since, for a market the size of Sacramento, some form of public investment was going to be needed. Taxpayers were understandably skeptical about putting public money towards a basketball arena. But after studying similar situations around the country, we in the Mayor’s Office concluded that, under the right terms and structure, we could deliver a public-private partnership for a new arena that would be a win for the Kings and for Sacramento. To get there, we needed to generate transformative economic and community benefits, something that was only possible if we used the arena to anchor the broader revitalization of our blighted and long-underperforming downtown core. In that respect, Sacramento really reminded me of the Denver of my childhood in the 1980s. At that time, Denver was perceived as a classic “flyover city” by people on the coasts. But over several years, the community and city leaders pushed through smart and strategic investments that led to a positive change in the city’s economic and cultural trajectory. Things really took off in the 1990s, in part due to the energy generated by Coors Field, the downtown ballpark built to be the home of our new Major League Baseball team, the Colorado Rockies. GSB: I remember visiting Denver during the late 1990s and saw how Coors Field had seemingly changed a whole neighborhood. Was the ballpark built by the team, the city or some combination? The reason I ask is that there are many studies showing that public investments in sports venues are not efficient uses of the public’s money. Where do you come down on that question? Kunal: Great question. Like a stodgy and aging arena, I think the rhetoric around public financing for sports venues is in serious need of an upgrade. There’s way too much dogma on a topic filled with nuance. In the case of Coors Field, the project was a public-private partnership, where taxpayers made a significant investment. As a local resident who saw that area before and after Coors Field, I would argue that the taxpayers’ investment paid off handsomely in catalyzing a true economic and cultural renaissance that continues to this day. But the success of Coors Field doesn’t vindicate all forms of public financing. The reality is that every situation is different, and plenty of sports facilities – too many I would argue – receive public funding in amounts and terms that are truly terrible deals for the public. When we were developing the Kings arena deal, we studied up on the good, bad and ugly of prior public subsidy deals. And we were determined that any arena deal we cut with the Kings would protect taxpayers and generate strong economic and community benefits. That process in Sacramento began by fighting to locate the new arena downtown, and resist temptations by some in town to “play small” and simply refurbish or rebuild at the old arena’s suburban location. Kunal: Yes. At the time it was built in the mid-1980s, that building size and location made sense. But by the 2010s, we had different civic imperatives around sustainability and urban planning. Beyond the economic appeal of a downtown location – analysts forecasted $150 million in new annual economic activity each year – we wanted the arena project to reflect the values of a community that cared deeply about the environment. So we set – and ultimately met – incredibly ambitious goals for green design, air quality, water efficiency, energy efficiency, transit, food, waste diversion, and so on. Kunal: My role evolved over the course of the project. At the start, I was the Mayor’s Chief of Staff, representing the Mayor and City in almost every facet of our work with the NBA, Kings, City and community to save the team and develop the arena plan. When the NBA voted to keep the team in Sacramento in May 2013, and approve the sale of the Kings to a new ownership group, I moved over to the team side as an executive focused on making sure we followed through on our promises to the community on the arena. GSB: That’s quite a transition. How did working for a sports team differ from working in municipal government? Kunal: Well, it’s safe to say that spending a Tuesday night at an NBA game is a bit more fun than at a City Council meeting! And I used to joke with friends – only half-kidding – that I could get more done chatting with various folks at a Kings game than I could ever do in one month at City Hall. There were obvious advantages to working in a private sector context in terms of speed, agility, and efficiency. But this deal was a true public-private partnership where both bodies were integral. What’s most powerful to me is that my spirit and purpose on this project never changed regardless of what my business card said; from beginning to end, this endeavor was always about doing something really big and historic and transformative for the people of Sacramento. And both the City and Kings wholly embraced that mindset. Kunal: As Opening Day for the Golden 1 Center got closer, I started getting calls from other folks in sports who were impressed by what we’d done in Sacramento and wanted to see if I could help out elsewhere. To his credit, then-Team President Chris Granger was extremely supportive, and I was able to transition from being a full-time employee to a consultant able to take on other work. As part of that transition, I launched Lotus Advisory with my sister Monisha as a strategy and management consulting firm focused on driving positive change at the intersection of business, government and community. Because of my background, I ended up specializing quickly on sports-related projects, while my MIT-educated sister took on high tech clients like Airbnb. In the years since, we’ve been lucky to work with an amazing range of clients in a variety of industries and sectors. In recent years, we’ve done a lot of work in soccer and baseball. I was the Chief Strategist for Nashville’s successful 2017 bid to join Major League Soccer, where we went from being on no one’s radar as a viable soccer city to finishing first in a twelve city race for the next expansion slot. A huge part of our success was powered by the people of Nashville – whose pride in their city is as strong as I’ve ever seen anywhere. Similarly, I helped lead and advise Sacramento’s bid to join MLS for several years, particularly in shepherding their downtown stadium development plan through the planning, predevelopment and approval processes. The heart and soul of that bid are the supporters of Sacramento Republic, the United Soccer League (USL) Championship¹ club that took the city by storm when it launched in 2014 and has woven itself deeply into the cultural fabric of Sacramento with remarkable speed. Currently, I’m working closely with the Oakland Athletics on their plans to revitalize the Oakland waterfront with a new privately-financed ballpark district near the Jack London Square area. It’s a really gorgeous project with a strong spirit of sustainability and environmental justice. GSB: Very cool! What’s the status of Sacramento’s MLS bid? I know they’re looking to get to 28 teams by 2021 or 2022. Cincinnati United began play this month as the league’s 24th club, with Miami and Nashville set to join next year and Austin in ’21. So that means there’s one more slot left in the near term. Kunal: Sacramento is one of two cities considered to be favorites for the 28th slot. I know that I’m biased, but I don’t think the competition is remotely close. Sacramento’s MLS bid stands alone as arguably the most resilient, mature, and comprehensive MLS bid in league history. Since embarking on the MLS journey in 2014, Republic FC has checked all the boxes time and again: a die-hard fan base, committed corporate support, a fully-approved and transformational downtown stadium plan; and a credible and committed ownership led by a formidable combination of Pittsburgh Penguins owner Ron Burkle and several local business leaders. MLS will be lucky to have Sacramento join its ranks and I’m cautiously optimistic that it will happen soon. The stadium will be built few blocks away from the Kings arena at a huge 240 acre site called the Sacramento Railyards that, when fully built out, will double the size of downtown Sacramento. The MLS stadium represents one of the first and largest major private investments in the Railyards in several decades, and will catalyze a historic wave of economic and community development. In terms of green features, the stadium will be another model of transit-oriented development, located a block from light rail, and a short distance by foot, bike, scooter, or rideshare from the rest of downtown. Republic FC has a terrific culture around local food and beer, so I’d expect some innovative sourcing strategies there as well. GSB: Turning to another long-running new stadium project, let’s talk about the Oakland A’s. Kunal: The A’s have a truly visionary plan to revitalize the waterfront near Jack London Square through a new Major League Baseball ballpark. The project will be LEED Gold Certified and reflect a “ballpark within a park” theme, with an intimate 34,000 seat stadium nestled carefully into its urban surroundings. The ballpark is privately-financed and will anchor a new, vibrant waterfront district that will feature a mix of housing, including affordable housing, offices, restaurants, retail, small business space, parks and public gathering spaces. And the team is also showing tremendous leadership by leveraging the ballpark project to address longstanding environmental justice reform issues around air, soil and water quality faced by West Oakland residents for years. GSB: Add the A’s new ballpark to my sports bucket list. OK, before we go, let’s talk a bit about your work as a board member of the Green Sports Alliance. How did that come about? Kunal: I’ve known and been a fan of the Green Sports Alliance since its earliest days, when Alliance leaders reached out to invite Mayor Johnson to the inaugural summit in Portland. The Alliance was hugely helpful in guiding my thinking on the Golden 1 Center, and I worked with the Alliance to help bring the Summit to Sacramento during the Golden1 Center’s inaugural season in 2017. I’ve continued to work closely with the Alliance since then, and at some point it just made sense to take on a more formal role. So, I joined the board last fall with a pretty important first project: co-leading the search for a new Executive Director. It was a fascinating process that yielded a terrific hire: Roger McClendon. GSB: McClendon comes to the Alliance’s executive director role at a key inflection point in the Green-Sports movement. I like to say Green-Sports 1.0 — the greening of the games — is now almost if not quite a given. It was a necessary and obvious first step. But Green-Sports 2.0 — engaging fans, players and more to take positive environmental action, specifically on climate change — which is where I think is starting now, is a more complicated, heavier lift. What do you think? GSB: …Or not even talking climate at all? Kunal: …we’re not going to push them too far beyond their comfort zone. GSB: But doesn’t that imply that it’s ok for sports not to go fast enough? That seems risky at best. Kunal: Well, it’s tricky. But here is a reason to be optimistic: things are impossible until they’re not. Looking at history, there are many social movements that looked bleak for years, or even decades, right until a period of rapid change that completely upended the status quo. I’m heartened by the younger generations — Millennials and Gen Zers — who will increasingly hold all institutions, including sports teams, accountable for the issue of climate change. The Alliance needs to be ready, and I think we’re taking important steps in that direction. If there’s one thing that I’ve come to appreciate deeply in my career, it’s that, with vision and leadership, sports can be an extraordinary platform for positive change. And on issues of climate, we can’t afford for sports teams, leagues, or fans to sit on the sidelines anymore. GSB: With some well-timed and positive pushing from organizations like the Alliance, I’ll say. To be continued, Kunal! ¹ The USL Championship is the second-tier of North American professional soccer, one level below MLS. The word gold will feature prominently in this blog post. The Golden State Warriors are fashioning one of the golden eras of NBA history, having been to the last three NBA Finals, winning championships in 2015 and 2017. And while the Houston Rockets — and perhaps others — look like they will be a worthy challenger, Stephen Curry, Kevin Durant, Draymond Green, Klay Thompson and the rest of the “Dubs” are favored to bring home championship gold to Oracle Arena in Oakland this June. Gold will also be an operative word when the club moves to San Francisco and the new Chase Center for the 2019-20 season — as in the LEED Gold certification the arena is expected to attain. GreenSportsBlog spoke with Peter Bryan, VP Construction and Development for the new Warriors arena, and Molly Hayes, LEED certification project manager for Mortenson︱Clark, to get a better sense of how, from the Warriors/Chase Center perspective, green is golden. GreenSportsBlog: Managing the construction for the new arena for the Golden State Warriors, an organization that demands the best from top to bottom, is a big job. Congratulations! How did you get here? Peter Bryan: Thanks, Lew. I worked for 19 years at Clark Construction, starting in 1997 in Bethesda, MD, working up to running all of the company’s pre-construction in Northern California and the Pacific Northwest. Clark built the MCI Center (now the Capital One Arena) in DC, home of the NBA’s Wizards and NHL’s Capitals, while I was there, although I didn’t work on that project. I moved to Clark’s Bay Area office in 2004. There, I was involved with pre-construction for my first sports venues — Galen Center, home of USC Trojans basketball, and the renovation of the press boxes at the Rose Bowl. Then I was involved in Clark’s bid on the new Warriors Arena at Piers 30-32. We came in second but kept in touch. When the site moved to Mission Bay, Piers 29-32, a new RFP was issued and we won it. I handled pre-construction. Then the Warriors replaced the person heading construction on the project. I had a good rapport with Steve Collins, Chase Center’s Chief Operating Officer who was overseeing the project for the Warriors. I approached him about coming to the club to run construction; one thing led to another and I signed on in May 2016. PB: Absolutely. Sustainability has been embedded in the project since its inception. Prior to my joining the project, sustainability consultants — as well as mechanical, plumbing and electrical engineers — Smith Seckman Reid developed a LEED scorecard and the sustainability plan in June 2013, held sustainability workshops with my predecessors two months later, and infused the project team with lofty sustainability goals and aspirations, as well as with a “what’s possible” point of view. GSB: What are Chase Center’s key sustainability features and benefits resulting from those lofty aspirations? GSB: …Wow…that’s the biggest bike valet I’ve heard of at an arena. PB: …Then once I joined the team, we put a big priority on water efficiency. The arena will feature a top quality water re-use program and other water use reduction measures. PB: Without a doubt. In addition to our water re-use program to reduce potable water use, we will have a very robust building management and HVAC system that will result in significant energy and water conservation. The HVAC system features IDEC or indirect evaporation and cooling air handling units. There are no high water usage, high energy use chillers involved in Chase Center. Instead the system is condenser-based, which is much more efficient given our local climate. Savings will also come from a gray water recovery system. We’ll recover the storm water off the arena roof, store it in the parking garage, treat it and put into a storage tank. From there, we’ll use it for irrigation, the toilets and urinals. GSB: In light of the mega five-year California drought, these water conservation measures could not be more timely or important. You mentioned mass transit before. Tell us more. PB: We have a lot going on mass transit-wise. There is the extension of the MUNI platform next to our plaza, which will feature the 18,000 seat Chase Center and two, 11 story office buildings (580,000 square feet of office space). That extension will handle more cars, allowing more people to get out faster. The MUNI connects to BART and also CalTrain commuter trains a mile away. Multiple bus lines will service the arena, with added buses on game days. And there will be shuttles from different points of the city. GSB: Do you have a projection of the percentage of fans that will use alternative and/or mass transit? GSB: …So 41-48 percent using mass or alternative transit and 29 EV charging stations? Impressive. Now let’s turn to waste. Will there be on-site composting? PB: But we will have a three-stream waste system: recycling, compost and landfill. The organics will be sent offsite for composting. The challenge is how do we get our guests to put their food waste in the right receptacles. Molly Hayes: Yeah, the Warriors consulted with the Sacramento Kings’ Golden One Center and the team leading the renovation of Madison Square Garden regarding waste diversion and one thing that’s unique about San Francisco is that 100 percent of waste streams must be sorted correctly. MH: …San Francisco has strict standards that we will have to meet. PB: We’re actively talking with the San Francisco Department of Environment to get to the best result. GSB: What about on-site renewables and energy storage? GSB: Very impressive, really. Now, I understand that Chase Center will be seeking LEED Gold certification but not Platinum. Reasons? PB: I think it comes down to lack of on-site renewables. But we are very happy to go for the Gold. Our first submission to the USGBC is this spring. PB: We’re excited about being able to operate a LEED Gold arena and office campus and for our opening in Fall 2019. The San Francisco 49ers, along with the Philadelphia Eagles, represented the NFL when leaders of global sports organizations and sustainability experts convened October 30-31 in Bonn, Germany at the inaugural UN Dialogue on Sport and Climate Action. Its primary goal was to develop collaborative approaches by which stakeholders at the intersection of Sport & Climate Change can contribute to achieving the long-term goals of the 2015 Paris Climate Agreement and the UN Sustainable Development Goals (SDGs). The gathering was a preliminary of sorts to the main event in Bonn: The 23rd session of the global UN Conference of the Parties, or COP 23. That larger summit was held to advance implementation of the Paris Agreement, the multi-national accord which aims to limit global average temperature rise to well below 2 degrees Celsius and as close as possible to 1.5 degrees Celsius, and to build greater resilience to climate change. You might have heard this is also the very agreement the United States, on the direction of President Trump, is planning to exit as of 2019. With Nicaragua and Syria having decided to join the Paris Agreement, that will leave the U.S. as the only country not to be part of the pact. Now, I’ve certainly heard of “American Exceptionalism” but this is ridiculous — along with wrongheaded and dangerous. The team earned its seat at the Sport and Climate Action table, thanks in large part to its LEED Gold certified Levi’s® Stadium, which opened in 2015. The Santa Clara-based stadium, which played host to Super Bowl 50 — generally regarded as the “Greenest Super Bowl Ever”^ — in 2016, is a leader among green-sports venues, as it features on-site solar, green roof, recycled water usage, composting and much more. The UN Dialogue on Sports and Climate Action featured two full days of workshops, panel discussions, and keynote speeches focused on leveraging sport and its ability to influence fan behavior in areas like energy consumption, water conservation, and more. Group working sessions included assessments of the sports industry’s impact on climate change, the risks to sport from climate change and related potential governmental policy decisions, and the expectations of the sports industry to be climate change advocates. The groups also discussed what the sports industry can do to promote broader climate action. Most of the 74,929 fans left Arrowhead Stadium in a funk on Sunday after the hometown Kansas City Chiefs’ 26-14 loss to the Buffalo Bills, their fifth defeat in the last six games. Those fans were likely unaware of perhaps the best thing to happen at the game — the introduction of compostable bags of peanuts, which concessionaire Aramark says is a first for sports. The Chiefs and Aramark made the compostable bags a reality by teaming up with bag maker/Green-Sports leader BASF and Hampton Farms, which is among the country’s top peanut suppliers. Aramark, which sells 15,000 bags of peanuts every season at Arrowhead, said Chiefs officials approached them to find ways to comply with the team’s Extra Yard for the Environment waste reduction and diversion-from-landfill initiative. As part of the 18-month developmental process, BASF worked with Missouri Organic Recycling in Kansas City to test packaging prototypes and ensure the final product met composting guidelines for quality and safety. The product is the first commercially available peanut bag to be made from BASF’s certified compostable ecovio biopolymer and Epotal adhesive. The Chiefs are selling the peanuts for $5.75 per bag, the same price as the old bags made of non-compostable materials. Fans at Arrowhead can dispose of empty bags at compost bins or leave them under their seats for postgame pickup and sorting. Philadelphia-based Aramark’s main objective, pending additional testing at other NFL stadia, is to expand the compostable bag concept to include all peanuts sold for all of their food clients. During Spotlight Nights, a Sacramento-area nonprofit will “take over” the arena and engage Kings fans through in-arena programming, social media, concourse activations, and more. The Spotlight on Sustainability Night was the first in this season’s three-part series with future game nights focusing on health and education. Yolo Farm to Fork took over the arena, sharing their message at an informational table and with special farm boxes in the suites and lofts in the arena. They educated fans on best practices for growing in-season produce, composting techniques and incorporating farm-fresh food into school lunches – thus helping Sacramento area residents reduce their environmental impact. The Kings made sure fans were engaged and entertained, with a “Veggie Race,” videos featuring farm-to-fork trivia, as well as sharing some of the team’s innovative practices that helped Golden 1 Center become the world’s first LEED platinum arena while earning GreenSportsBlog’s “Greenest New Stadium/Arena” award for 2016. Like many of us, Diana Dehm understands that humanity needs to take significant actions to take on climate change to avert its most severe effects. Unlike most of us, she’s devoted her work life towards that end. The LA-based Green-preneur hosts the Sustainability News and Entertainment Radio Show and is president of Climate and Sports Youth Summits, a series of events that uses sports to engage students from primary grades through high school in climate change education. GreenSportsBlog talked with Ms. Dehm to understand, 1) the motivation behind her climate change-fighting spirit, and 2) what Climate and Sports Youth Summits are all about. GreenSportsBlog: Diana, there is so much to cover so let’s get right to it. When did you get into the environment, into climate change? And when did you decide to work in this space? Diana Dehm: Thanks Lew for all you do. You are right there is SO MUCH to discuss! Growing up in California until I was 15, I always had a passion for clean oceans. I’m a diver, sailor and a SUP Surfer or Paddleboarder. Moved to the Boston area at 15, went to Lesley University there, ultimately came back to Southern California. Started out as an environmental health and safety consultant; working for clients like AT&T, NBC, NCR and many more. Companies like those had started to get that sustainability was good for business. Eventually I moved up and became a VP for two large environmental consulting firms. GSB: What did you do for those firms and their Fortune 500 clients? DD: We provided strategic counsel, environmental, health and safety (EHS) audits, and helped them integrate sustainability and environmental better practices into their businesses. We pushed them beyond mere compliance, demonstrating that doing so would drive social and tangible value for their companies and, in the process, reduce CO? emissions. We worked with companies on their supply chains, helping them to replace high polluting suppliers with companies that worked towards making “zero impact” by emphasizing biodegradability, recycling and more. Then, we would seed these stories into the media. GSB: That sounds great — can you give us an example? DD: Sure! GE needed environmental and health training at their NBC studios in the Los Angeles area — this was before they sold NBC to Comcast — and so I led that effort with an awesome team. GE and NBC were great leading the way towards educating their many employees. GSB: Impressive! Sounds like you were on a great track in the corporate sustainability consulting world. What made you change course and where did that change take you? DD: 2007-2008 was the game changer. My dad became ill with pancreatic cancer and I contracted a MRSA bacterial infection; was in and out of the hospital for a month. DD: That was quite the wake up call! It strengthened my need to do big things for humanity and the planet…and FAST. So I quit my job as a VP/partner and, with the encouragement of several clients, went off on my own. GSB: What did you do? DD: I started working on technology innovation and how it connects to sustainability and more…Big Data, City integration, Predictive Technology, Virtual Reality, and Sense Technology…LOVED IT. In 2009, I started Sustainable Business Partnerships. It brought technical innovation and top-flight business thinking to the triple bottom line/CSR world. Some examples: I worked with Hewlett Packard Labs in Palo Alto, and I helped support tech innovation for a city in Southern California for which Hewlett Packard managed IT. GSB: As a career-shifter and pivot-er, I have to say, you are a role model! But how did this lead to a radio show? GSB: Had you been on the air before? DD: NEVER! I had NO IDEA WHAT I WAS DOING! Really, no clue. And here I was hosting a one hour show every Tuesday. I really just wanted to create a platform to share the solutions on the planet happening right now. Remember the economy in 2010 wasn’t so great. Thought we needed some inspiration from amazing guests from around the world! GSB: One hour can be a loooonnng time in radio! DD: You ain’t kidding, Lew. So like Nike says, I “just did it.” I found myself on the air the following Tuesday as the host for Sustainability News & Entertainment. Flew to New Hampshire to do the shows. It was so much fun interviewing and learning about some of the most sustainable innovations on the planet and how we can connect the dots globally to take action. Interviewed a broad range of folks — sustainability directors, sports executives, green-minded kids, scientists, politicians, musicians, artists, celebrities, the military –my early guests were especially brave. I stay connected to many of them to this day. GSB: Terrific! Flying east to do the shows? That sounds, well, unsustainable. DD: You’re right. So in 2010 we built a “Studio in a Box,” a flexible studio, for me..I can travel the world with my studio in a box. It was awesome at COP21 in Paris. GSB: Amazing. How are you funded? DD: I’ve self-funded the show because I do like the feeling of being able to work without corporate influence. I do plan to seek outside funding but would only do so if I maintain editorial control. I am convinced sustainability-minded sponsors would benefit greatly by reaching our green-minded global audience that reaches 3 to 5 million. GSB: HOLY COW! How did you build that kind of audience? DD: The market was ready and open: when the show started in 2010, there were few green-themed radio shows. The show’s real-world, solutions-based and positive ethos was unique…that’s why our tag line is an open sourced focus on solutions happening on the planet right now. GSB: Not pie-in-the-sky, though, right? GSB: Really? I think controversy is what radio station owners want? DD: You would think. But the economics of the traditional, terrestrial radio business was changing — so I went to the digital world, streaming live shows, podcasting and using social media to reach a global audience of next generation entrepreneurs and innovators. That was clearly for the best as now we are blessed with having that low seven-figure audience. GSB: Not to be redundant, but Holy COW! DD: Thank you! It really is amazing. Anyone can listen live anytime, anywhere. I was surprised to learn that the biggest audience segment is in China — interesting to correlate that with how fast China is growing their renewable energy market. Russia and Brazil also contribute significantly; the US is third in audience size. GSB: What do your listeners learn about? DD: How people are making a living driving positive human impact while reducing environmental impact. From climate reduction, to zero waste, to water harvesting, to renewable energy – from the race car world to celebrities to musicians to CEO’s. Now, like I said before, I haven’t made money doing the show so I continue to make my living through sustainability consulting, working with non-profits, corporations and schools. GSB: Ahhh…schools! So now I see most of the Diana Dehm picture: the radio show, your interest in education. Where does your interest in Green-Sports come in? Did you ever cover Green-Sports on your show? DD: YES! First of all, I saw the sports-environment-planet connection about 20 years ago but didn’t know what to do with that. But then I went to the first Green Sports Alliance Summit and was hooked. — I’m a sports fan and an athlete so I know the power of sports. I saw the potential connections between sports, solutions-based thinking and innovation. So that’s a part of my consulting work. And, we have done lots of sports-themed radio shows. I love them. I can’t recall the year right now — when we had 10 people — from teams, stadium managers, all talking about what they were doing to green the sports world, and how they were influencing sustainability more broadly. It was GREAT! We’ve done several Super Bowl-focused shows, talked with NFL Green’s Jack Groh and the Green Sports Alliance’s board chairman Scott Jenkins about Zero-Waste Super Bowls. We’ve had Justin Zeulner, Executive Director of the Green Sports Alliance, on our air…. DD: …So I came up with the Trash On Your Back Challenge, made it up. Drew and I pulled some heavyweights to the table to try it — Rear Navy Admiral Len Hering, the aforementioned Atlanta Falcons GM and GSA Co-Founder Scott Jenkins, Former Senior Policy Counsel at the Office of Chemical Safety and Pollution Prevention, US EPA Matt Bogoshian, Former President/CEO, along with many others. We walked around with our trash on our back for 5 days and learned the hard way that the average person in the US generates 4.4 pounds of trash per day. Carrying that weight around on your back provides an incentive to reduce it…right? It was smelly too, so we end up innovating ways to avoid waste and smell. The Challenge still goes on today. Thousands of people around the world have taken it, diverting tons of waste from what I call our earthfills – our earth and our oceans. GSB: I can only imagine How low did you go? DD: Together we were able to knock down the 4.4 pounds of trash per day, down to 0.8 pounds on average. It’s all based on simple choices. GSB: That’s an incredible reduction! So how did you get from Trash on Your Back to Climate and Sports Youth Summits? DD: After attending several Green Sports Alliance Summits, I realized there was only one thing they were missing: kids. Kids love sports, of course. After working on student summits for many years, I shared my idea of having a kids module at the Green Sports Alliance Summit with their executive team. They loved the idea and saw great potential impact. GSB: Who was on your team and what did you end up creating? DD: I brought in a great team: One of most brilliant, sustainability-minded principals I knew – the former coach, and Co-Founder and CEO of the Green Schools National Network, Jim McGrath and asked him if he would like to start a non-profit focused on harnessing the power of sports to motivate K-12 students and college students to take action on climate change. Thankfully, he said yes and we proceeded to bring two other education superstars from Florida: former Olympic soccer player, teacher, and founder of the How Low Can You Go Net Zero Energy Challenge, Linda Gancitano. And Broward County’s Sustainability Teacher of the Year; Elaine Fiore. GSB:…Don’t know Jim but I do know Linda and Elaine, interviewed them in fact. LOVE “How Low Can You Go” — sports teams working with schools on a challenge to reduce the schools’ carbon emissions…I can’t imagine two better people for your team. DD: Indeed, they are the best! GSB: So what did you all come up with? DD: We partnered with the NBA’s Miami Heat for our first Climate and Sports Youth Summit, which took place at American Airlines Arena. Students, athletes and celebrities came together for a fast-paced, educational, fun day. Started at 9 AM with the tip off: “Game On For the Planet.” Brought a basketball and started passing it around quickly. Anyone who caught it had to shout out something they would do to protect the planet, reduce carbon emissions, etc. Then we took tours of the American Airlines Arena and were shown the recycling systems, the LED lighting and the other sustainability aspects of the building’s operations. We had students presenting to students, engaging them with games like “Climate Eliminators” and “Recycle Relays” and we took the “Trash On Your Back” zero waste Challenge – and the students left with their own climate action plan along with knowing we are there to support them. GSB: They must’ve loved it! DD: For sure. And we taught them, through the “How Low Can You Go Challenge,” how they could help their schools reach Zero Energy. We also asked them for their own ideas. One great one was “Plastic Mermaids” — a symbol of the need to get plastics out of the oceans. The kids brought them to the mayor of Broward County, FL. The Mayor liked it and showed it to the state senate in Tallahassee. GSB: And then you brought Climate and Sports Youth Summit to the Green Sports Alliance Summit (GSA) in Sacramento in June. What was that like? DD: Oh it was a big success…It was a two-day program at Golden 1 Center, the LEED Platinum home of the Sacramento Kings, vs. one day in Miami. We had 60 students, mostly from the local area. Day 1 was similar to Miami. On Day 2, the students monitored waste, recycling and composting stations in the arena. There was a scavenger hunt where the students were challenged to go to the various sustainable product and service exhibitors at the GSA Summit and learn about their sustainable innovations and thinking. And then the kids got to do some “trash talking” while manning the trash and recycling receptacles, helping adults learn how to recycle and compost. Afterwards they headed down to the court where they got to feel like an NBA player. GSB: Sam Lewis and Jesikah Cavanaugh from the Beaver Athlete Sustainability Team (BAST)? DD: Yes! They shared how, by creating the first student-athlete-run sustainability organization, they are helping Oregon State fans get involved in the greening of their games. GSB: Did you have corporate sponsors in Sacramento? DD: Whole Foods Market supported us, giving out healthy food to the kids. And the Sacramento Municipal Utility District (SMUD) provided funding and built awareness for the program. GSB: That’s great…So when’s your next Summit? DD: We’re heading to Boulder, CO, the University of Colorado in December. Hosted by Dave Newport, their Director of Environment. Can’t wait! And 2018 will be bigger and better. Our goal is to obtain funding so we can host 20 summits per year and then grow from there. So sponsors, please join us and support our kid’s futures. I like saying “Love them, educate them, support them, and get out of the way!” – Kids get it and, once given the tools, will take action on climate! A powerhouse of American collegiate (aka university) sports from the country’s heartland. 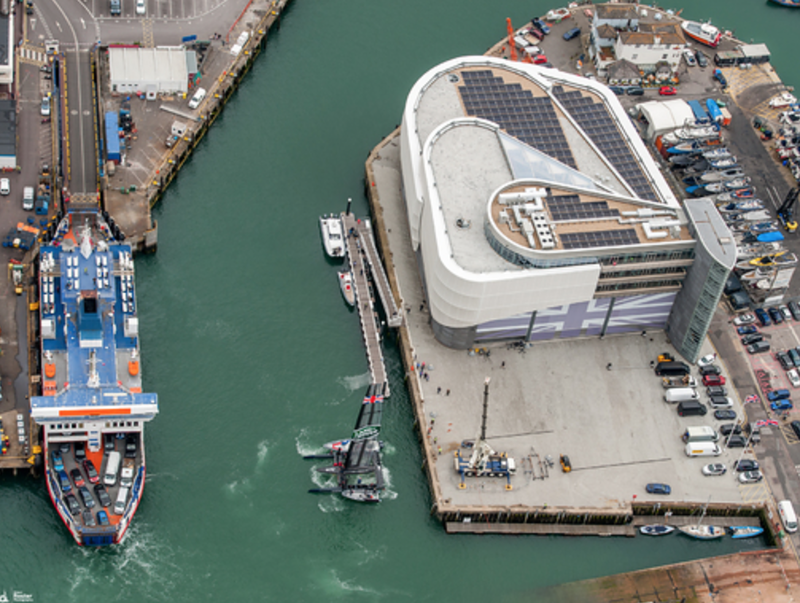 The team trying to bring the America’s Cup home to Britain for the first time. One of the most anonymous teams in the NBA. And a fifth division English football team. What could these four seemingly unrelated sports organizations have in common? THE Ohio State University Buckeyes, Land Rover BAR, the Sacramento Kings and Forest Green Rovers are four of the greenest teams on the planet. This story was originally posted on 100% Sport’s website. Ohio State is one of the gold standard programs in college football, winning its eighth national championship in 2015. The 65,000+ student, Columbus-based school also owns 29 other National Collegiate Athletics Association (NCAA) championships, including a title in men’s basketball, and multiple banners in swimming (11) as well as women’s rowing (3). There’s no other way to say it: Ohio State is a college sports powerhouse. And, while Ohio’s pro loyalties are largely split between Cleveland in the north and Cincinnati in the south, it is Ohio State, in the centrally located capital city of Columbus, that is the closest thing to a unifying force in sports in the state. With more than 106,000 fans filling Ohio Stadium (aka The Horseshoe) at every home football game and with millions following the Buckeyes on TV, radio and online, the impact of Ohio State football is massive. Given the huge fan base and audience, the potential impacts of Ohio State’s Zero Waste home football games–the school just completed its 4th straight Zero Waste football season–are also staggering. Zero Waste events are defined as diverting at least 90 percent of waste from the landfill via recycling, composting, or repurposing. The Buckeyes diverted an insanely great 96.35 percent of in-stadium waste in 2015, winning the Big Ten Conference diversion rate championship for the fourth consecutive year. Results for 2016 are not complete but it looks as though OSU football’s diversion rates will be similar to the prior year’s. Ohio Stadium is thought to be the biggest Zero-Waste stadium in the world. 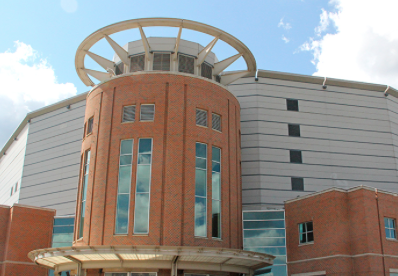 And the Schottenstein Center, aka Value City Arena, the 18,000+ seat home of Buckeyes basketball and hockey, which opened in 2000, is getting into the Zero-Waste action, expecting to get there sometime in 2017. Out of 175 people surveyed in 2014, all but 3 thought that Ohio State Athletics has some level of responsibility (slight, some, and strong) to add environmental efforts into their athletics operations. Yes, it’s a small sample size, but directionally it’s telling. The rest of the campus is taking the green lead from Ohio State football: Diversion rates across the entire university have almost doubled since the pre-Zero Waste football days, rising from 16.1% in FY 2004 t0 30.4% in FY 2015. Food waste, with the help of OSU Zero Waste volunteers, is transported to Price Farms Organic, a composting facility in Delaware, Ohio. The waste is eventually turned into a mulch called Stadium Scarlet (the school’s colors are scarlet and gray), which Buckeyes fans, most of whom are landscapers and/or homeowners, purchase for $40 per cubic yard. 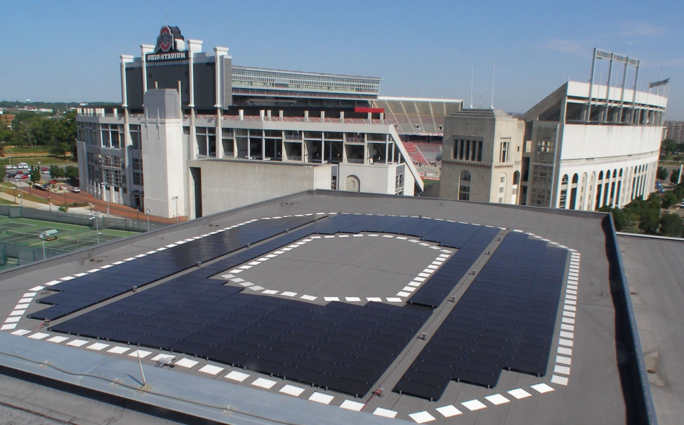 A 101 kW, 237 panel solar array was installed in 2014 on the Recreational and Physical Activities Center roof, adjacent to The Horseshoe in the Buckeyes’ iconic Block O configuration. It makes for a great aerial scene-setter shot–and a terrific talking point. Fans of the University of Colorado-Boulder, with its absolutely sterling record of sports-sustainability leadership (Zero-Waste, on site solar, state-of-the-art water conservation and restoration programs), might say “Ohio State is great, but what about us?” And they have a point. Highlighting OSU is not a knock on Colorado—far from it. Our feeling was that Ohio State deserves particular kudos because it is in the green conversation with a school like Colorado (in eco-haven Boulder) despite being in the center of a state that voted for Donald J. Trump. That is a BIG DEAL! Sir Ben Ainslie is the most successful sailor in Olympic history, winning medals at five consecutive Olympics (1996 to 2012), including gold at the last four; he also played a key part in Oracle Team USA’s stirring comeback to capture the 2013 America’s Cup. While his past is certainly legendary, it is two aspects of the future that animate Ainslie’s life these days. Number one is his role as skipper of Land Rover Ben Ainslie Racing (BAR), Britain’s entry in the 35th America’s Cup, to be contested in Bermuda starting in May. The challenge isn’t that big—no, it’s only about bringing the Cup to the UK for the first time ever. And Britain has been trying to win the darn thing since 1851! 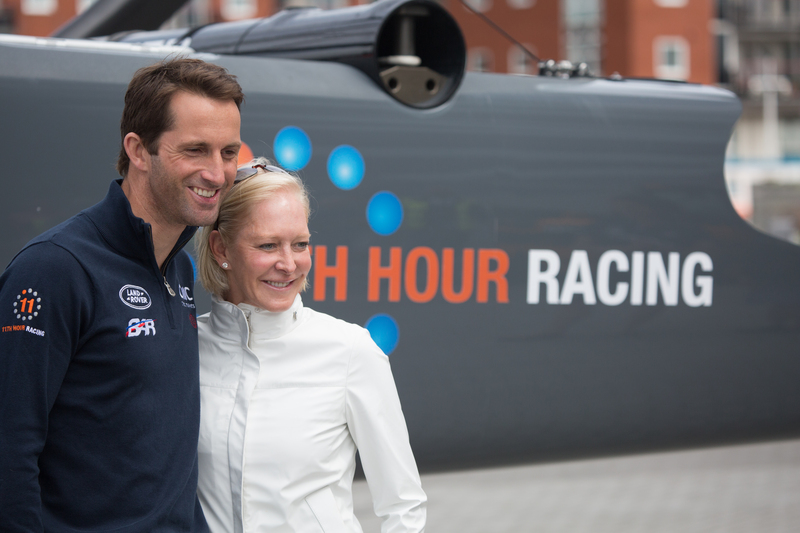 That there’s room for anything else on Ainslie’s plate these days is astounding, but his will to win is matched with the need to do so with purpose —and his purpose is to use his platform at the top of the sailing world to advocate for clean oceans, the climate change fight and to bring sustainability to the rest of the sailing world. Employing Life Cycle Assessment (LCA) to make its operations as environmentally friendly and smart as possible. It does so by determining how best to use, reuse and dispose of materials from design to end-of-life. The team built its base in Bermuda employing sustainable construction features. 11th Hour Racing is funding an educational center open to the public, in close proximity to the America’s Cup Race Village where event organizers expect an average of 10,000 visitors/day during the competition. The 11th Hour Racing Exploration Zone features interactive exhibits on topics such as innovation and technology, ocean health, invasive species, the New Plastics Economy and renewable energy, as well as a STEM classroom. Along with Bermuda’s leading environmental organizations, the team and 11th Hour Racing are developing a legacy project around the lionfish, an invasive species creating havoc in the Atlantic Ocean and the Mediterranean. The goal is to raise awareness, promote lionfish as a sustainable and delectable choice of seafood and support an innovative solution to mitigate the invasion. It’s been a long decade+ for Sacramento Kings fans. On the court, the club hasn’t made the playoffs since 2004. And the team was under constant threat of relocation from 2006-2013. That threat ended with the 2013 sale of the Kings to local businessman Vivek Ranadivé. And, despite another poor start this season, Sacramento fans and the community at large can be proud of the leadership the team is displaying in the NBA in the climate change fight through the construction and October 2016 opening of Golden 1 Credit Union Center, the first LEED Platinum arena in the world. Platinum is the highest level of certification awarded by the US Green Building Council, representing the top three percent of buildings certified. 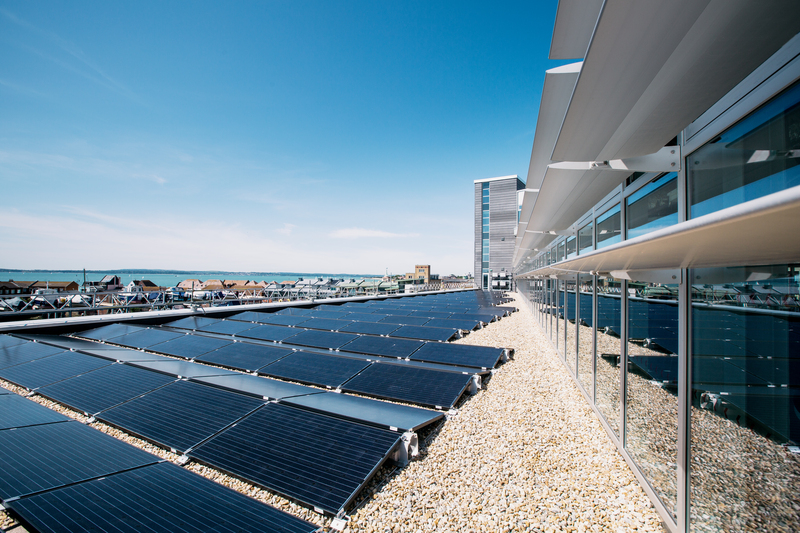 At the top of the Kings’ green list is the club’s commitment to generate 100% of the building’s electricity from solar power. Randive & Company are giving the fans what they asked for. Golden 1 Center will be the first indoor arena in the world to derive 100% of its electricity from solar energy sourced within 50 miles of the arena–the Kings will buy 85% of its electric load from Sacramento Municipal Utility District’s (SMUD) new 10.9-megawatt solar farm; the other 15% will come from solar panels atop the building’s rooftop. Want more green firsts? 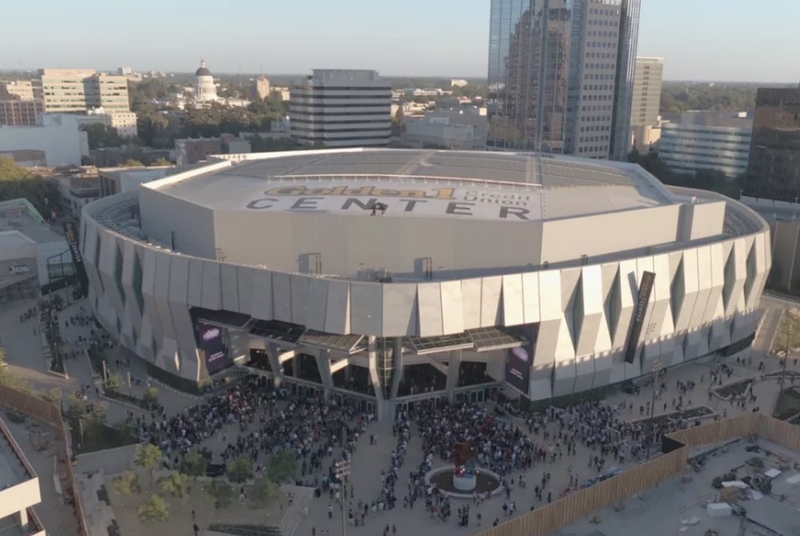 Golden 1 Center is the first arena in the world to be both indoor and outdoor. How can that be possible? By featuring five massive hangar doors above the grand entrance that open and allow the arena to use a natural cooling phenomenon in Sacramento – The Delta Breeze – to control the building’s climate efficiently, that’s how! But, wait…there’s more: The Kings’ architectural choices are estimated to keep nearly 2,000 tons of greenhouse gas emissions annually out of the atmosphere – equivalent to emissions from approximately 4 million vehicle miles. But, when you look closer, you’ll see a club that, on the pitch and especially off, should be a model for all professional sports teams on either side of the pond. It starts with ownership. Dale Vince, OBE, became the club’s major shareholder and Chairman in 2010. He also is the Founder/Owner of Ecotricity, based in nearby Stroud, which is taking on the challenge of reducing up to 80 percent of Great Britain’s carbon footprint. Since 1995, Ecotricity has become a green “triple threat”, dealing with electricity (through wind and solar project development), AND transportation (EV battery chargers at highway rest stops) AND food (in the concept stage on wind powered tractors and other clean farm energy projects). The company is privately held, pays no dividends and so profits are plowed back into the building of more clean energy. Thus, Ecotricity’s motto: Turn (electric) Bills Into (wind) Mills. Al Gore is a fan. It is the largest private sector employer in the area. Ecotrcitiy has serious green cred. While energy efficient LEDs are increasingly the rage at sporting venues vs. the traditional, energy-sucking Metal Halide lights, Vince says LEDs are not energy efficient enough. So they’re looking into lower energy lighting. Does anyone doubt they’ll figure this one out? There are solar panels on the roof and also ground-mounted solar powered car ports at The New Lawn. The latter are visible to all fans entering and leaving the stadium, further cementing the greenness of the club among the fan base. And the organic pitch is mowed by a solar-powered “Mow-Bot.” I kid you not. Finally, click here to see a terrific 8-minute video from Collectively, a non-profit that uncovers, shares and scales up “exciting ideas for a future we want to live.” You get an unvarnished, up close view of what fans–both FGR and away supporters–think and feel about this fascinating experiment at the intersection of Green + Sports. Let us know what you think. Meanwhile, I’m ready for a veggie burger!